Surfside Villa ,Beachfront, comfortable, cozy secure and on the water!!!! Secure Beachfront Vacations!!!! Be on the beach and hear the ocean as you fall asleep or waking up! Really a comfortable place to chill and relax. All the watersports you could want yet lots of beach for sunning. This is a gated community with 24 hr security. Walk to the Ritz and enjoy 5 different beaches within 5 minutes drive. St Thomas Yacht Club is on the same beach for the sailors. CARIBBEAN FISH MARKET, a gourmet restaurant, and SANGRIAS, more of a burger, sandwich, pizza place are both on site and within a minutes walk of the condo!! Walk home in seconds! This is one of the nicest beaches and there is no cruise ship traffic so you really do have some nice privacy. The swimming pool has a waterfall and the Jacuzzi is always hot!!! 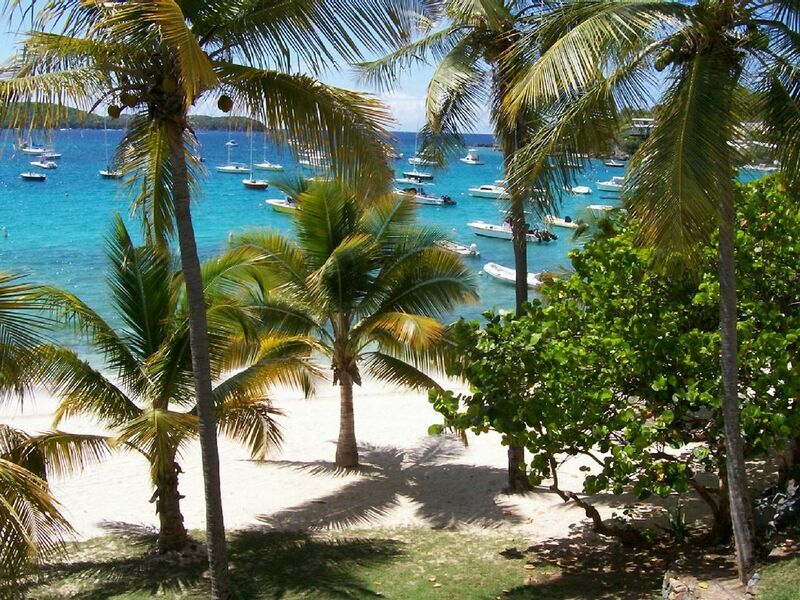 You'll be a short drive ( 5 minutes or less) to Red Hook, with excellent shopping, a huge selection of additional restaurants, the Ferry Dock with trips to St John and the BVI's, American Yacht Harbour Marina, to many bars to mention and all kinds of stuff!! If your looking for a fabulous beach, steps to the ocean, and close to everything else, this is your choice. We loved our stay at Bob's condo on Cowpet Bay. First of all, this unit, #33 is absolutely the closest to the beach. You just get out the front door, turn right, a walk down a couple steps. You're right there. Bob is a great host, was very responsive (apparently works right down the street 2 minutes away), and was able to answer questions we had quickly. The unit itself is spacious and quiet. I don't know if there were other people next door, as we could not hear anybody. As other reviewers have said, there's a lot of what you need already in the condo (about the only thing you need to bring is shampoo.. there's soap, laundry detergent, bath and beach towels, some toys, cleaning supplies etc). For you technically inclined folks, there is DSL internet access with Wifi that is decent (great reception in the main area, but less reliable reception in the bedrooms). i was able to stream netflix, and my slingbox fairly well. Cable TV was on the fritz while we were there, but there's a Smart HDTV that you can watch Netflix, Prime Video and other things with if you dont want to just use your tablet or phone. There's a nice Weber gas grill for you to use and all necessary grill utensils. Washer and drier in the unit are ok. The washer is LOUD though so don't plan on running that when you want to hear the TV or sleep. The pool (which is shared with the Elysian) is also very nice (and yes, it is open now but the pool bar was still under construction as of 4/12/2019), no separate kiddie pool so be aware of that if you absolutely want to have one. Grocery store is a $6 cab ride away. i highly recommend going to the Food Center vs going to Moe's, as the Food Center is a nice big grocery store with a LOT more selection, and decent prices, compared to Moe's which is a little market and more expensive (if you have one, bring an insulated grocery bag and use a freezer pack that is in the freezer there to keep your milk and such cold.. getting a cab back may take a few minutes). However, Moe's is in the town of Redhook, and is right next to the pharmacy, so if you need any drug store supplies, it's an easier stop to that in the same trip. All in all, a great place, and we definitely plan on staying there again! This was perfect for our young family. Steps from the beach & very nice pool! Bob was great to work with! Nanny services was great to deliver a pack n play before we even arrived! Enjoyed our time! Property location was just perfect, just as advertised. Condo well stocked (kitchen, towels, beach supplies), could not have asked for more. Condo-worth stating again, perfect location-on the beach. Very nice layout, perfect for the 4 adults in our group. My only complaint, living room furniture was not comfortable at all. Would I return to this condo, absolutely!! Bob-thank you for allowing us to stay in your beautiful condo, in beautiful St Thomas. Just perfect. The location is beyond words. Sorry the beach bar was still under construction but it will be open soon! Hope to be able to go back and check on it!! ABSOLUTE PERFECT LOCATION. BEACH VIEWS AMAZING. THIS CONDO WAS PERFECT FOR RELAXING AND ENJOYING TIME WITH MY HUSBAND AND FRIENDS. EVERYTHING WE NEEDED WAS INCLUDED AND PROVIDED HERE (BEACH CHAIRS,TOWELS, COOLERS, KITCHEN ITEMS, ETC.). GREAT LOCATION IN RED HOOK CLOSE TO LOTS OF GOOD RESTAURANTS AND THE FERRY. WOULD ABSOLUTELY STAY HERE AGAIN . BEACH BEAUTIFUL, NO CROWDS AND VERY SECURE. Great view quiet, close to various activities and beach. Clean, good location, close to various beaches and activities. Well kept, clean. Host thought of everything you would need and prepared a book of suggestions to guests. Very helpful, would recommend a stay anytime.